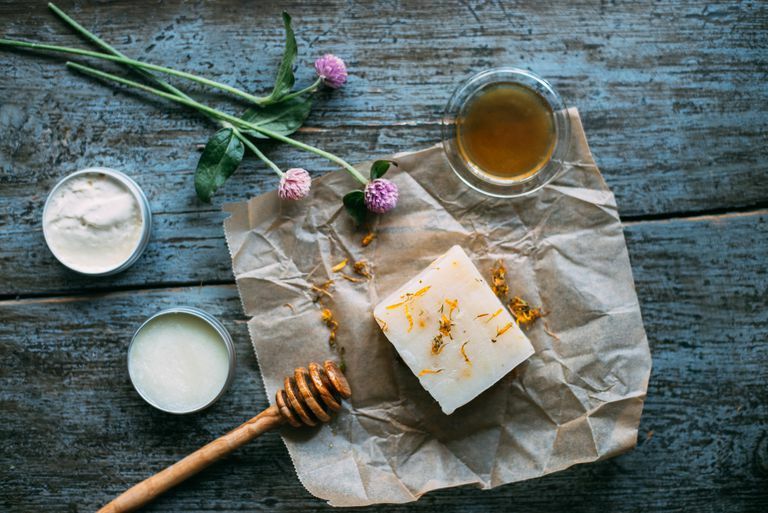 Are You Allergic to Your Skin Care Products? An itchy red rash after using a cosmetic is an obvious sign of an irritant or allergic reaction. But sometimes sensitivity to skin care products can be more insidious and sneaky – extreme dryness, a flaky patch of skin, pimple-like bumps or an uneven skin tone. Yes, these somewhat simple and seemingly unrelated skin issues may also be a sign you're sensitive to the products you're putting on your skin. Dermatitis is the term used to describe any red, itchy, irritation of the skin. Derma- means "skin," and the suffix -itis means "inflammation." So, dermatitis literally means "inflamed skin." Dermatitis can be caused by many things. When it's caused by something that touches the skin, it's called contact dermatitis. Skin care products, makeup, and personal care products like deodorant and shampoo are common causes of contact dermatitis. The vast majority (estimated 80 percent) of all contact dermatitis cases are irritant contact dermatitis. Your skin is irritated or sensitive to something that you've touched. Irritant contact dermatitis can develop quickly after exposure to an offending substance, within a few hours or even minutes. But it can also take days or sometimes weeks for irritation to develop. Whenever we have a reaction to a product, we often say we're "allergic" to it, but this isn't always technically the case. Irritant contact dermatitis is It's not a true allergic reaction because the immune system is not involved. The reaction is restricted to the skin only. Allergic contact dermatitis is much less common. It's a true allergy to a substance. In allergic contact dermatitis, the reaction is often more severe with intensely red, itchy, swollen skin. The reaction typically takes about 12 hours to develop and peaks about 48 hours after exposure. Textbook contact dermatitis symptoms include reddened, raised bumps and itchy skin. Sometimes, small fluid-filled blisters also develop. But contact dermatitis is not always this acute or severe. You may have mild irritant contact dermatitis without an obvious itchy rash. Sometimes the only symptom is dry skin. Maybe it's a flaky patch that never seems to go away completely. Or maybe your skin just looks slightly reddened and dehydrated no matter how often you moisturize. Your skin may have a rough, uneven or sandpapery look. Skin may feel hot to the touch or look flushed. Your face is the most common place to develop his mild, chronic type of contact dermatitis. It's especially likely to crop up on the eyelids, cheeks, around the corners of the nose and mouth, and the chin. Mild, chronic contact dermatitis is most often caused by skin care products: soap, facial cleansers or body washes, lotions or creams, toners, or makeup. Right now you may be saying, "But I've been using these skin care products for ages, and I've only recently had this problem." Your skin can actually develop a sensitivity to a product over time. It's precisely because we use our skin care products every day, week after week, month after month, that irritation can develop over time. It's not that the products are "bad" or unhealthy for your skin, per se. Long-term exposure to an offending substance can gradually create a low-grade irritation. So that cleanser or lotion you've used for years may, in fact, be what's causing your skin issues today. There are literally thousands of ingredients used today in skin care and cosmetic preparations. And, although everybody's skin is different, we do know that certain ingredients are more likely to cause irritation than others. Fragrance is a common culprit. Most skin care and body care products contain fragrance because we like our products to smell good! But although it's noted as just one item in the ingredients listing, "fragrance" can actually be comprised of hundreds of ingredients of its own. Research has shown that ingredients used to create these fragrance blends are among the most sensitizing of skin care additives. If fragrance is the most sensitizing skin care ingredient, preservatives run a close second. Although these ingredients are necessary to ensure you have a safe product (no one wants to put spoiled or rancid preparations on their skin) preservatives also can cause contact dermatitis in some people. The most common sensitizing preservatives include parabens, formaldehyde and formalin, imadazolidinyl urea, isothiazolinone and methylisothiazolinone, and quaternium-15. Are You Allergic to the Color Red? FD&C (food, drug, and cosmetic) and D&C (drug and cosmetic) colorants are also common ingredients in skin care products. While not nearly as common fragrance and preservative sensitivity, colorants can also cause contact dermatitis for some people. People can also be allergic to these colorants when used in foods. Thinking of switching to an all-natural product to avoid having a skin reaction? All-natural ingredients can cause contact dermatitis, skin irritations, and allergic reactions as well. Essential oils are used to naturally add scent to skin care products and cosmetics. And, just like with artificial fragrance, essential oils can trigger a skin reaction in sensitive people. Tea tree essential oil is listed as most sensitizing, comparatively. And this oil is an extremely common ingredient in skin and hair care preparations. Look for it listed in the ingredients as Melaleuca alternifolia. Other essential oils that are more likely to irritate sensitive skin are peppermint essential oil, ylang ylang essential oil, clove, cinnamon and cassia oils. Another natural ingredient that is commonly linked to contact dermatitis: lanolin. Lanolin is derived from sheep wool is used in moisturizing products like body lotions and facial creams. So if you're having a reaction to a cosmetic, don't overlook your natural or organic products. Think of it this way—poison ivy and stinging nettles are completely natural, and we all know what they do to the skin! If you have skin that is especially sensitive, hypo-allergenic skin care products can be a good choice. These products contain ingredients that are considered "low-risk" of causing a reaction. But everybody's skin is different. Having a product labeled fragrance-free, hypo-allergenic, or for sensitive skin, is no guarantee they won't cause contact dermatitis. It's much less common but still can happen. Don't assume your hypo-allergenic products are not the cause of your sensitivities. It's less likely, but they very well could be. Sometimes it's easy to narrow down the problematic product by when and where the irritation is occurring: Was everything good until you started using that new body wash? Does your face only burn and itch after you apply a specific moisturizer product? If you're having a mild reaction, and you haven't started using any new products, try removing one product from your regimen at a time to see if your skin improves. It may take two to four weeks before you really notice a difference. Pinpointing the exact ingredient that is causing the problem is tougher. If you can generally use most cosmetic products without issues, only a few select products cause problems, and the skin reaction isn't severe, it's probably not worth the time and effort to track down the exact ingredient that's giving your skin fits. Just avoid the products you know cause problems and it's a happy world. But if your skin is under constant siege from irritation, you don't know what you can safely use on your skin, or reactions tend to be long-lasting or severe, it's helpful to know exactly what's causing your dermatitis. That way, you can avoid those ingredients and save your skin. In this case, the best choice is to see a dermatologist for a patch test. Various substances are applied to the skin, usually on your back, and covered. After 48 hours the covering is removed the dermatologist examines your skin for possible reactions. Often the skin is reexamined, anywhere from two to seven days after the patches are removed. Since there are literally thousands of ingredients used in skin care preparations, it's impossible to test them all. Instead, the patch test tests between 20 to 30 of the most common culprits – ingredients that are responsible for causing the majority of contact dermatitis cases. Armed with the knowledge of what causes your skin to react, you now must become an avid label reader. Also, be sure to know any alternate names your allergen may go by. Many ingredients are listed by their Latin or botanical name (peppermint is Mentha piperita, for example). The good news is most cases of contact dermatitis will go away on its own, provided you stop using the offending product of course. Minor irritation can be treated at home. For more serious cases of contact dermatitis, you should pay a visit to your physician for help treating it. Either way, treat the affected area gently. No scrubbing, no perfumed soaps or lotions. These can aggravate already irritated skin. If the area is dry and cracked, you can put on a thin layer of petroleum jelly or soothing ointment like Aquaphor. Although it's tough if your skin is itchy, try not to scratch the area. Allow the skin to heal. Your physician can prescribe topical medications to control the itch and help the skin heal if needed. You may have to put on your detective hat to figure out exactly which product or ingredient is causing your contact dermatitis. But with patience and time, you can help get your skin back to a healthier, happier state. Cheng J, Zug KA. "Fragrance Allergic Contact Dermatitis." Dermatitis. 2014 Sep-Oct; 25(5)232-45. Tan CH, Rasool S, Johnston GA. "Contact Dermatitis: Allergic and Irritant." 2014 Jan-Feb; 32(1):116-24. Verhulst L, Goossens A. "Cosmetic Components Causing Contact Urticaria: a Review and Update." Contact Dermatitis. 2016 Dec; 75(6):333-344. Could You Be Experiencing a Makeup Allergy? Have You Ever Heard of an Allergy to Sunscreen? Could You Be Allergic to Your Hair Dye? Could You Be Allergic to Cinnamon? Are Cephalosporins Safe If You're Allergic to Penicillin?